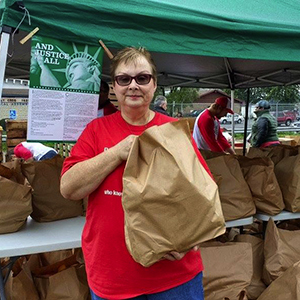 On September 30, 2016, Soldiers' Angels opened their Veteran Mobile Food Distribution in Detroit, Michigan. The event, in partnership with Gleaners Community Food Bank of Southeastern Michigan, was a huge success despite some very rainy weather and flooding. In addition to distributing food to Metro Detroit veteran families, representatives from the VA were on hand to distribute flyers about VA services. Detroit was the first site to fill the registration and go on a wait list for a grand opening event. See more pictures from the event here.